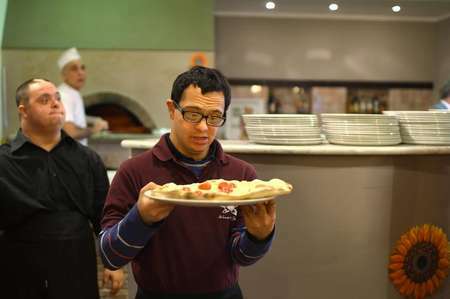 It was another busy night for the staff with Down syndrome at the Girasoli restaurant in Rome, which serves up traditional pizza and pasta dishes along with a new way of looking at disability in the workplace. 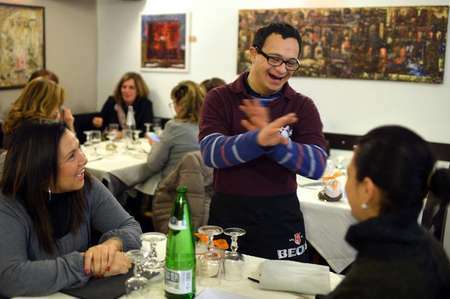 The neon-signed restaurant was set up in a suburb southeast of the Italian capital by the parents of children with disabilities, and it functions just like any other eatery -- except 13 of its 18 employees are handicapped. "I love this room, monitoring it, making myself available, being in contact with people," said Simone, a 24-year-old who after a paid internship of 600 hours now has a permanent contract with Girasoli (Sunflowers). "And above all I just love being here!" he said. When a group of women came in Simone deftly showed them to a table, clutching a few menus in his hand. "We heard good things about it so we wanted to come," said one woman, while her friend added: "Basically it's a normal restaurant -- except the waiters are nice!" As he tucked into an amatriciana pasta dish, 64-year-old teacher Giuseppe said: "When you come here for the first time, you have certain expectations but you quickly realize that there is no need to have them!" The restaurant was set up in 2000 and is aimed at offering work to people with Down syndrome -- a genetic disorder usually associated with physical growth delays and intellectual disability but many manage to complete university degrees and hold down jobs. "My waiters do their job and do it very well," said chief waiter Ugo Menghini, who is not handicapped, praising the efficiency and speed of his staff. "If I was to set up my own business, I wouldn't hesitate, I would hire people with Down syndrome." Like many businesses in Italy, the restaurant has been hit by the recession and was forced to shut for several months last year for restructuring and renovation. It is now being run by Consorzio Sintesi, a social co-operative association which specializes in giving jobs to disabled people and also manages three call-centers for the Italian mobile phone operator Wind. "The state pushes for assistance but we prefer professional training. Everything here is self-financed with no subsidies from the state," Enzo Rimicci, the head of the association, told AFP. "Every employee here manages to find their place based on their skills," Rimicci said, explaining for example how one staffer, Marco, was too shy to work with customers but proved to be "a real machine" in the kitchen. "Seen close up, no one is normal," he said, repeating an old Roman proverb that he likes. The restaurant's training is rigorous and out of the 13 employees with Down syndrome, nine are still interns. When Girasoli is closed in the morning, another team comes in to make cookies and cakes for the evening customers. Anna, a 22-year-old waitress, came in even on her night off to have dinner with her parents. "For us, for her it's a great victory," said her father, Carlo, tearing up as he described his daughter's transformation since she started work. "Our daughter has gained autonomy. When she comes home from work, she is happy, proud of what she's done," he said, adding that Anna had also made progress "in how she relates to other people, in her language." A further sign of the restaurant's success is that another one is in the works. A new one is expected to open soon in Palermo in Sicily and Rimicci said there were even plans to turn the idea into a franchise and create many more outlets.